Deltas exclusive Model Delta-C Center Insulator and Model CIN End Insulators which are molded of Deltalloy™, an extremely tough and durable plastic specifically blended to withstand sunlight and extreme weather conditions. The use of stainless steel hardware and heavy 12 gauge pvc coated solid copper wire assures that this antenna will tolerate the harshest environments. For proper installation, feed the antenna wire through the strain relief holes on each side of the Delta-C Center Insulator, wrap it back on itself approximately 3-5 turns, then route the end of the antenna wire to the solder lug on each set of connection hardware. A small loop may be formed from the wrap to the lug to relieve tension. 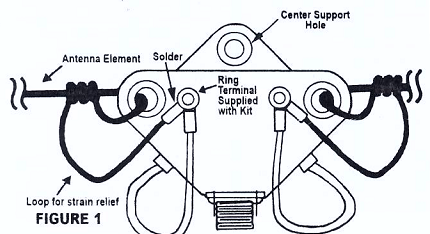 See the drawing for suggested connection method (be sure to reinstall the hardware in the same sequence as provided--washers, nuts, etc., and do not overtighten the wing nuts). Some typical antenna lengths (overall total for both sides of dipole) are listed in Table 1. 160 meters - 260 ft. 120 meters -195 ft. 90 meters -142 ft.
80 meters - 126 ft. 49 meters - 79 ft. 41 meters - 63 ft.
40 meters - 66 ft. 25 meters - 40 ft. 22 meters - 34 ft.
20 meters - 33 ft. 19 meters - 30 ft. 16 meters - 27 ft.
17 meters - 26 ft. 15 meters - 25 ft. 13 meters - 22 ft.
15 meters - 22 ft. 12 meters - 19 ft.
10 meters - 16.5 ft.
Model SEP Arc-Plug™ Static Electricity Protector is a special gas tube component designed to bleed off slow rising static electricity buildup of the kind generated by thunderstorms, high wind driven snow or sand or by a harmless looking cloudy day. These static charges have been measured to several thousand volts and can damage or destroy sensitive components in receiver or transceiver front end circuitry. For proper operation of the Protector, it will be neccessary to ground the coax shield at the entrance to the building. Your station may already meet these requirements if your coax shield circuitry is grounded to a ground bus, bulkhead, strap, braid or ground rod through the connector on your coax. If the Model SEP protector takes a strong surge "hit" beyound its rating, it is designmed to fail "shorted" to indicate the need for a re[placement. This willl be indicated by a large increase in VSWR, or a "dead" receiver since the antenna will be shorted to ground at the Center insulator. Your equipment will still be protected until removal or repacement. To remove the Model SEP Protector, simply remove the antenna connection hardware and remove the SEP which is installed in the cavity on the back of the Model DELTA-C Center Insulator. Reinstall the hardware in the same sequence as provided. When using the DELTA-C for high power transmitting it may be neccessary to remove the SEP Cartridge when VSWR exceeds 2:1. Also, to assure the maximum protection of your sensitive equipment from lightning/REMP induced surges, we recommend the use of our Alpha Delta Transi-Trap Surge Protector at the point where the feedline enters the building.